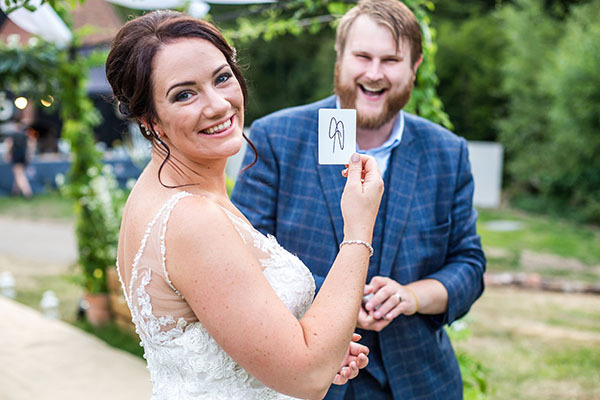 Bedfordshire wedding magician, Christopher Whitelock, is one of the country’s top close up magicians, with years of experience performing at weddings in the UK and around the world. 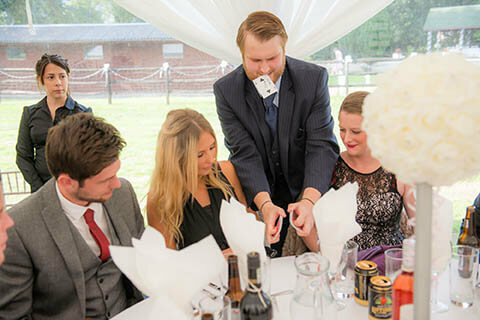 Christopher’s sophisticated and charismatic style of close up magic makes him the number one choice for your Bedfordshire wedding. His mixture of classic tricks, digital magic and mindreading will blow your guests’ minds and create a buzz that’ll get them relaxing and talking all night. Chris has performed at many wedding venues in Bedfordshire, such as Luton Hoo, Woburn Abbey, Hallmark Hotel Flitwick Manor and the Auction House in Luton. His unique skill and flair is the perfect ice breaker at your wedding and will create a lasting impression that will make sure your guests remember your special day for a long time! Bedfordshire wedding magician, Chris, is often asked to perform during the drinks reception after the wedding ceremony. This is a very popular time as your guests will be entertained while you and your new spouse are busy having your official photos taken. Chris’s style of magic is the perfect ice breaker for groups of guests creating magical memories that are carried on throughout the day. Christopher is one of the top international table magicians in the Bedfordshire area. He will interact with your guests at your wedding breakfast as they wait for their food to be served. Chris will liaise with the waiting staff to make sure that the appropriate table gets a unique table side show at the right time. Magic is the perfect distraction for guests who might be waiting a while for their food to be served. I don’t know whether to be amazed or to just burn you at the stake. I was captivated from start to finish, exceptional entertainer. Truly fascinating, I could watch you for hours. Unlike anything I have ever seen before, totally blew me away. One of the finest purveyors of the magical arts I have ever seen. We knew as soon as we watched all the videos and read his reviews we had to book Christopher immediately. That’s why we booked him over a year in advance. Christopher blew us all away. Our guests were truly amazed and enjoyed the magic and good humour. Christopher made a real difference to our day and I can’t thank you enough for the unforgettable entertainment.